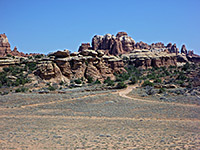 The Needles district of Canyonlands National Park covers a vast area and has plenty of trails, though the majority are concentrated in just one part, south and west of the park road. The wilderness further west (The Grabens) and either side of Salt Creek to the south is essentially pathless. Many of the trails intersect, and a typical hike involves combining several of them, to form a loop. See also hikes in the Island in the Sky. The Chesler Park topographic map shows the location of the central trails. Cave Spring 0.6 (loop) 80 The Cave Spring trail starts at the end of a spur road close to the Needles visitor center, and winds around a white/red sandstone plateau above the wide, bushy valley of Salt Creek. The easy, varied route passes the spring, some pictographs, and relics from an old cowboy camp that was inhabited from the late 1800s to about 1960. Pothole Point 0.6 (loop) level Pothole Point is renowned for its pretty reflective pools that form after rainfall, filling depressions in the flat Cedar Mesa sandstone rock. The easy, cairned path circles around a small mesa and also has good views over the Needles formations and Big Spring Canyon. If hiking right after rains there will be hundreds of potholes and pools, the largest up to 10 meters across. The holes form because of slightly softer patches in the rock, and enlarge due to erosion and acid in the accumulated rainwater. Roadside Ruin 0.3 (loop) level The shortest trail in the Needles begins opposite the visitor center and leads to an ancestral Puebloan granary dating from about 1200. Slickrock Foot 2.4 (loop) 80 Starting near the end of the scenic drive at Big Spring Canyon, the mostly level Slickrock Foot Trail loops around a sandstone plateau, with 4 short spurs to overlooks of Big and Little Spring canyons and excellent views across the whole Needles area towards distant mountains. Confluence Overlook 5.5 200 This excellent hike crosses several shallow canyons then traverses more open country, ending at a viewpoint of the junction of the Green and Colorado Rivers. Lower Big Spring Canyon 5.0 500 An off-trail route to a viewpoint of the Colorado River. Lower Elephant Canyon 5.0 800 A cross-country route along a seldom-explored canyon. Chesler Park 3.0 level overall This path passes varied terrain, across Elephant Canyon to the edge of Chesler Park - an unspoilt meadow ringed by the colorful, jagged rocks of the Needles. The first viewpoint is reached after 3 miles, from where another trail circles the edge of the meadow. 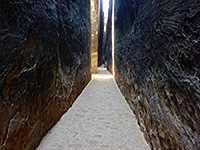 One of several other routes radiating from the park is the Joint Trail, which winds southwards through cool, narrow passages between vertical rocks. Red Lake Canyon 9.5 1,400 The only direct route to the Colorado River in the Needles is along Lower Red Lake Canyon, 2 miles south of the confluence with the Green River. The path begins along the Devils Lane road, just east of Cyclone Canyon, a point reached either by hiking from Big Spring Canyon Overlook, or (slightly shorter) by 4WD vehicle or on foot starting from the Elephant Hill trailhead. 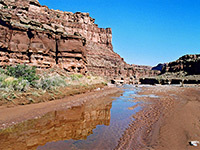 Lower Red Lake is a deep, overgrown, rocky but quite short canyon, without any obstructions, that meets the Colorado just upstream of the start of the rapids in Cataract Canyon. The round trip to the river is normally done over 2 days. Big Spring Canyon-Elephant Canyon 11 (loop) 400 One of a number of possible loop hikes in the Needles, this combines the first two thirds of the route to Druid Arch with a return along other canyons to the east. The trail leaves Elephant Canyon via a side ravine then follows the far upper end of Squaw Canyon for a while, before crossing a pass and into Big Spring Canyon, which it follows downstream to the junction with the Druid Arch Trail and back to the Squaw Flat campground. Like most hikes in this area, the trail passes a great variety of terrain, including narrow canyons, steep slopes and slickrock benches. Big Spring Canyon-Squaw Canyon 7.5 (loop) 350 The hike around upper Big Spring & Squaw canyons is the shortest major loop in the Needles, with relatively easy walking along flat valley floors and just one strenuous part across a high pass that links the two drainages. 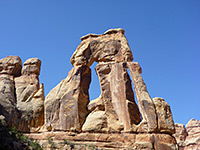 Druid Arch 5.4 650 The double span of Druid Arch is a popular hiking destination, and is reached by the southernmost trail in the Needles, starting like several others from Elephant Hill. The route is south and later west across an open plateau, past one junction with an alternative approach from Squaw Flat, then through a narrow gap into the wide streambed of Elephant Canyon. Turning south (downstream), the trail passes three more junctions (west to Chesler Park, east to upper Squaw Canyon and west to the Joint Trail) and ends by climbing a short ladder right at the far end of the canyon, directly below the arch. Lost Canyon-Squaw Canyon 9 (loop) 400 This loop hike explores two adjacent canyons that are quite different in character. 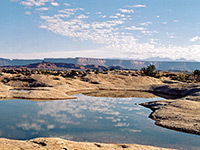 If walking clockwise, the first part is the same route used to reach Peekaboo Spring, as far as Lost Canyon, where a right turn leads along this densely-vegetated, watery drainage to its upper end, then over a high ridge on the west side into Squaw Canyon, which usually has no stream so is more arid and open. The Peekaboo Trail is rejoined after a 1.6 mile walk down this ravine, then the trailhead is 1.1 miles further. Peekaboo Trail 5.0 270 feet Beginning at Squaw Flat campground A, this path heads east, across two canyons (Squaw and Lost), and over high benches in between, descending via a ladder to Peekaboo Spring at the edge of Salt Creek, where it intersects a 4WD route that leads back north towards the visitor center.